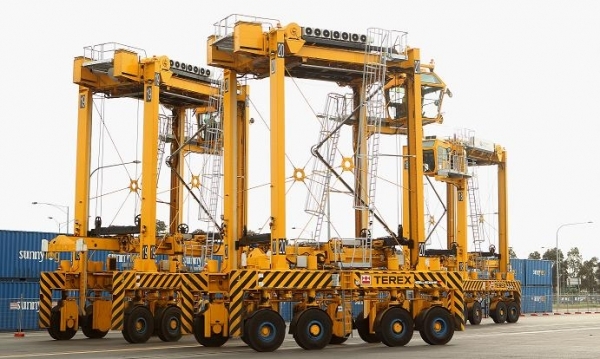 DP World, the world’s third largest port operator, yesterday launched a three-month trial into the use of Caltex B20 Bio-Diesel Fuel in its eight new Terex Noell NSC 644 E Diesel-Electric straddle carriers commissioned at the Port of Melbourne, Australia. The Dubai-based terminal operator will review the results of the trial and the B20 fuel, which uses a blend of fuel containing 20 percent of renewable products, with a view to using the the fuel in the remaining straddle carriers in use at DP World Melbourne. “The investment in new equipment and commencement of the biofuel trial forms part of DP World’s commitment to sustainable work practices in an effort to help reduce the broader Port of Melbourne’s carbon footprint,” said DP World Melbourne General Manager, Andrew Jena. DP World Melbourne currently consumes around 500 kilolitres of diesel per month, and it is anticipated that the straddle carriers’ advanced power management software will help to reduce fuel consumption at the site considerably. “This new equipment will also help deliver twin benefits of reducing DP World’s carbon emissions as well as improving efficiency and productivity at Australia’s largest container port,” said Ganesh Raj, DP World Australia’s managing director. The launch of the new straddle carriers was also marked by the visit of Victorian minister for ports Denis Napthine. The minister was also updated on DP World’s capacity expansion plans at the West Swanson Terminal.